Ignore the fact that it's warm now – here are some upcoming titles to keep you warm this fall: our November releases! Laugh in the face of danger – Grave Danger! 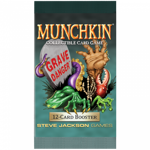 This expansion for the Munchkin Collectible Card Game helps you build a deck that's more fun than a barrel of mummies! Each booster pack contains 12 randomized cards, at least one of which is rare or better. It's a killer addition to your CCG collection! Use these booster packs to enhance your Munchkin CCG Starter Set or Introductory Set to give you more options! Space . . . it's big, cold, and dark. You need a vehicle. You need a spaceship! 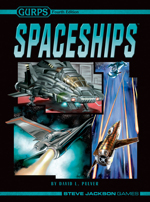 GURPS Spaceships presents a simple design system that minimizes the math and maximizes your options. Pick a hull, fill it with components, and you're done. Size is no obstacle . . . it takes only minutes to build even the largest spaceship. All this comes with basic rules for space travel and combat, so you can blast off right away! There's no party like a Munchkin party! 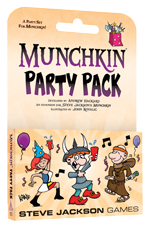 Party like a munchkin with the Munchkin Party Pack! It contains a 15-card mini-expansion that you can add to all your Munchkin games, as well as three copies each of five NEW Munchkin cards to give away to your friends as party favors!